The first plane in the second phase of a direct charter flights service between Egypt and Japan arrived in Luxor international airport on Sunday evening. The direct flight from Tokyo airport arrived with 231 Japanese tourists on board. EgyptAir weekly flights to Tokyo and Osaka airports stopped in 2012, following a decline in the number of Japanese tourists visiting Egypt. In April, EgyptAir resumed direct charter flights between Osaka and Luxor airports in the first phase of its charter flights service. The resumption of flights to-and-from Tokyo constitutes the second phase of the service. In a similar step, Egypt's flagship airline resumed in October trips between Luxor and London, following a one-year suspension of flights between the two destinations. 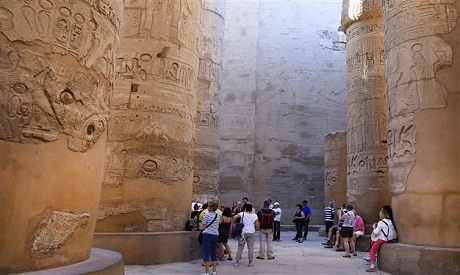 The company's chairman, Safwat Mosalam, said that the resumption of flights to Upper Egypt's Luxor aims "to revive tourism in the city, which is considered one of the most important touristic destinations in Upper Egypt. This is part of the company's commitment to bringing tourism back to Egypt, which is a crucial source of national income." Egypt's tourism industry has been hit hard since a Russian airliner crashed in Sinai in 2015, killing all 224 passengers on board. Luxor was named the 2016 tourism capital of the world by the United Nations World Tourism Organisation.